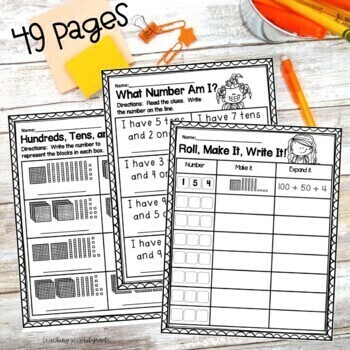 These Place Value Worksheets provide extra practice for your first or second graders. They can be used for seat work, centers, assessments, interactive notebooks, and fast finishers. 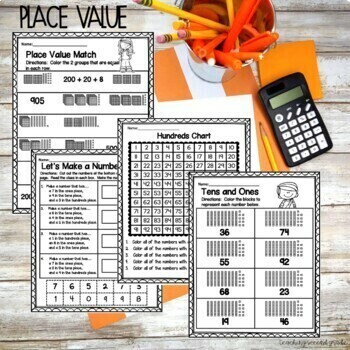 Do your students need practice learning about place value? 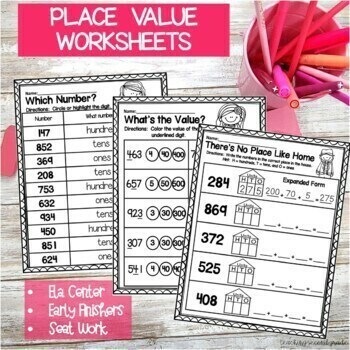 Then this 50 page set of Place Value Printables are just what you need. I have included a variety different ways for your students to get lots of practice. represent the blocks in each box. ►2 Pages of Hundreds, Tens, and Ones ~ Directions: Write the number to represent the blocks in each box. ►2 Pages of Hundreds, Tens, and Ones ~ Directions: Color the blocks to represent each number below. ►4 Pages of ~ What Number Am I? ►2 Pages of ~ Which Number? Directions: Read the clue. Circle or highlight the correct digit. ►2 Pages of ~ Roll It! Make It! Write It! ►4 Pages of ~ Let's Make a Number! Directions: Cut out the numbers at the bottom of the page. Read the clues in each box. Make the number. ►4 Pages of ~ There's No Place Like Home! Directions: Write the numbers in the correct place in the house. Then write the expanded form. ►2 Pages of ~ Base Ten (Expanded Form) Directions: Write the expanded and written form to represent the base ten blocks below. ►4 Pages of ~ Spin a Number! Use a paper clip and a pencil. Spin 2 times. Write the numbers down. Draw the number with base ten blocks and write the expanded form. ►2 Pages of ~ Place Value Match ~ Directions: Color or circle the 2 groups that are equal in each row. ►2 Pages of ~Cut and Paste Directions: Cut out numbers below. Match them to the correct blocks. 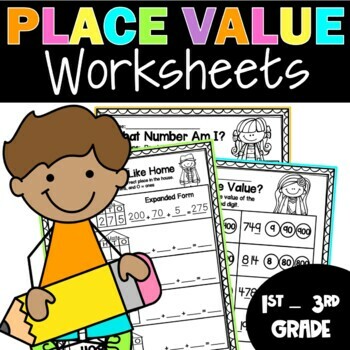 ►Place Value Booklet: (5 pages) Directions: Write the number, value, and the expanded form. notebook and fold up on the dotted lines.